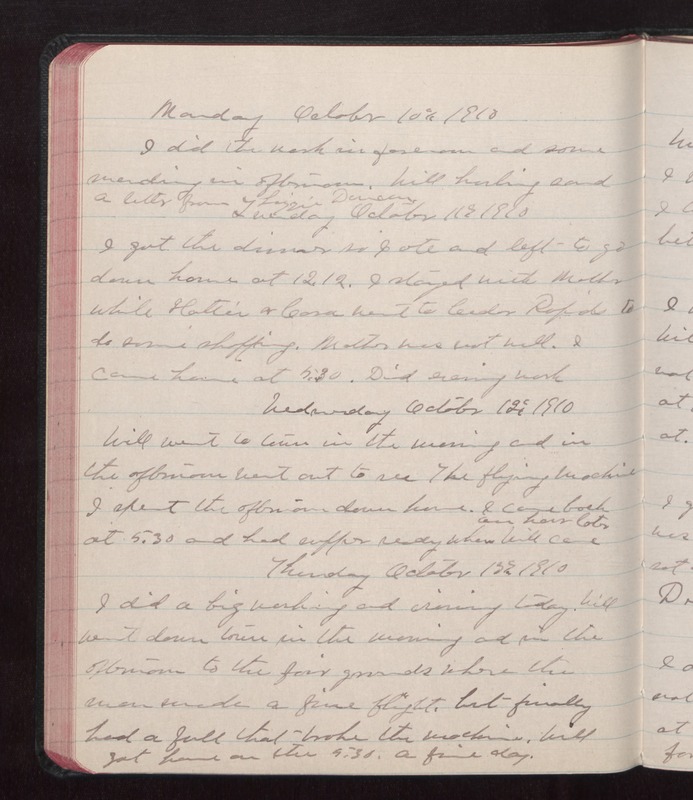 Monday October 10 1910 I did the work in the forenoon and some mending in the afternoon. Will hauling sand A letter from Lizzie Duncan. Tuesday October 11 1910 I got the dinner so I ate and left to go down home at 12.12. I stayed with Mother while Hattie & Cora went to Cedar Rapids to do some shopping. Mother was not well. I came home at 5.30. Did evening work. Wednesday October 12 1910 Will went to town in the morning and in the afternoon when out to see the flying machine I spent the afternoon down home. I came back at 5.30 and had supper ready when Will came an hour later Thursday October 13 1910 I did a big washing and ironing today. Will went down town in the morning and in the afternoon to the fair grounds where the men made a fine fight. but finally had a full that broke the machine. Will got home on the 5.30. a fine day.